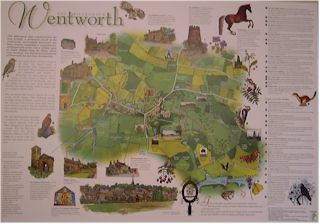 The WVCA has produced an excellent full colour map of the Parish of Wentworth. Measuring 23x16inches, it includes pictures of local fauna, flora and places of interest along with extensive historical notes. Over 480 hours work went into the creation of the map, which has been printed in an exclusive limited edition of 1000. This is a real collectors item. Priced at only �5 (+P&P;). All proceeds go to the Wentworth Village Community Association (a registered charity) and are used for community purposes.